John Field holds a female brown trout he caught on the Farmington River in the summer of 2009. John Field said he has a "Johnny Appleseed" approach to the Great Outdoors, only rather than scattering apple seeds the Weston man spreads interest in the outdoors and conservation. Field, 53, is a fly fisherman who encourages children to take an interest in outdoor activities for their own enjoyment, but also in hopes that will lead them to become good stewards of the environment. Field is a casting instructor, certified through the Federation of Fly Fishers, and teaches a fly casting clinic in Central Park each year and other clinics throughout Fairfield County. He also serves as president of the New York City chapter of Trout Unlimited and president of the American Casting Association. Both are volunteer positions. According to Field, the national chapter of Trout Unlimited spends about $20 million annually on conservation and education in an effort to enlist more people as protectors of the environment. Through the New York chapter of Trout Unlimited, Field helps children learn about the life cycle of trout and make connections to their drinking water in a program that has students raising trout in their classrooms. "We've been effective in inspiring New York students to grow trout and learn about their habitat. They also get to visit their habitat and release the trout. Students leave the program wanting to protect those waters," said Field, who recently returned from a conclave of the Federation of Fly Fishers in west Yellowstone. "Our drinking water, if it's pure, supports wildlife and humans." "Trout is an indicator species. They are sensitive to contamination in their water," said Lilli Genovese, coordinator of the New York City Trout Unlimited Trout in the Classroom program. "It's like the canary in the coal mine," said Field, who grew up in New York City. 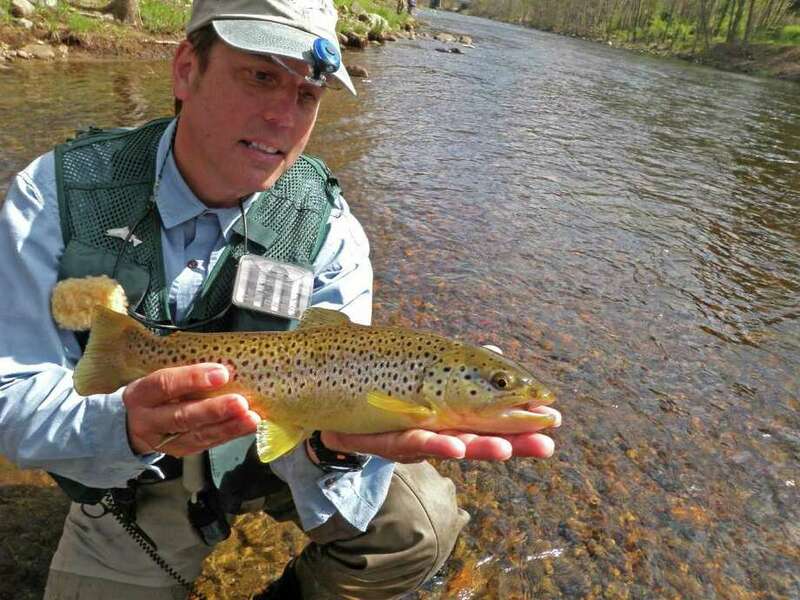 Ed Albrecht, Connecticut's coordinator for the Trout in the Classroom program, said there are about 70 schools in Connecticut involved, including five in Fairfield County. Students get trout eggs in November. They hatch in late December and then before the end of the school year the fish have grown sufficiently that students can release them to stock streams and rivers. Field's lifelong passion for fly-fishing and other pursuits in the natural world began when he was only three years old and was sidelined by a disability that prevented him from running and other strenuous physical activities for five years. Field spent that time in a wheelchair and his father, to help occupy his time, introduced him to Ellis Newman and Hank Hunter, who taught him to hunt and fish. Not that the two sports can't be strenuous, but for a young boy it was the perfect introduction to nature outside of what he had seen in Central Park. As his father had hoped, the activities did occupy his time then and since have come to occupy his life. Field said his focus is on raising his children, conservation efforts and sharing his fishing skills with others. He is grateful that his partnership in a family business allows him to spend so much time on outdoor interests. "I teach as much as I can and promote the organizations that I think are good for the public and nature," he said. His interest in introducing children to the natural world also began at a young age. "I did a fundraiser from my wheelchair when I was 6 years old," Field said. The money he raised was contributed to Newman's efforts to bring disabled children hunting and fishing in the Catskills. Today, he is involved in several fund-raising efforts, trying to train the next generation of fly casters, and for Trout Unlimited's Trout in the Classroom program. Field is also working to get fly-casting recognized as an Olympic sport. "It can be very athletic. It's like a throwing sport, like javelin or shot put," he said. Instead of casting fly rods, Field's most immediate project is encouraging the public to cast votes for the New York City chapter of Trout Unlimited, one of 41 organizations under consideration for funding awarded through the Tom's of Maine "50 States for Good" initiative. The five finalists that receive the most online votes will each get $20,000. There are no Connecticut organizations in the running Voting is live at www.50statesforgood.com and open through Sept. 10. The five winning projects will be announced in October.